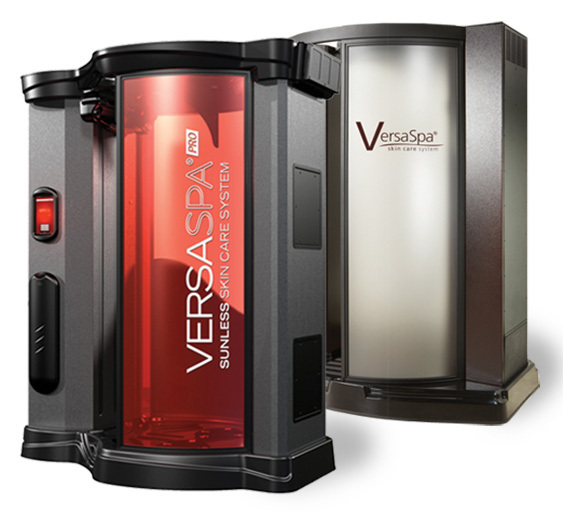 All of our locations feature the latest in Spray Tanning Technology. A sunless Tan with the precision of airbrush, but in the privacy of your own booth. The result is a golden glow that is 3 to 5 shades darker than your natural skin and can last 5 to 7 days. 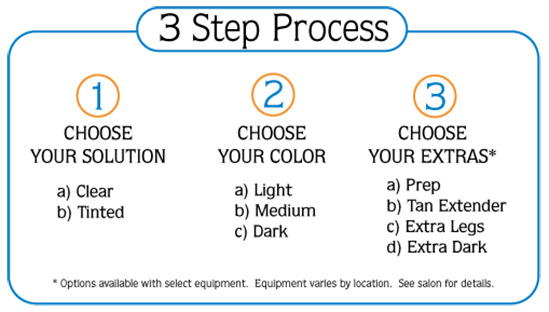 With our 3 step process, getting in and out of the salon for your session is quick and easy. 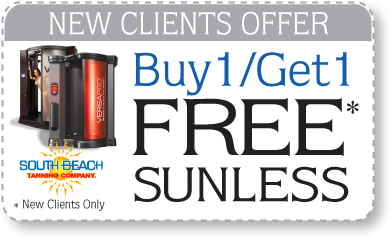 Getting the Most of Your Sunless Session! Before Your Session – Preparation is Everything! Shower and shave – Now is the time to get that shave in. Better before your session than after! Exfoliate – Use a body scrub to thoroughly exfoliate your skin. Spend extra attention on thick skin areas such as knees elbows and ankles. Moisturize – If your skin is dry you can use a mild moisturizer 2 hours before your session. The better option would be to apply Prep Gel, available in our stores prior to your session. Do not wear perfume or deodorant to your session as it can cause splotching. After Your Session! – Extend the life of your Tan! Wear loose fitting clothing and avoid tight undergarments. Avoid perspiration – this is not the best time to hit the gym! Wear open shoes – Flip flops are perfect. Avoid getting wet – No swimming or playing in the rain! Wait 4 to 6 hours before you shower. In the shower, use your hands to apply body gel. Do not use a loofah, sponge or wash cloth. After your shower, moisturize 2 to 3 times a day. Moisturized skin is going to maintain your tan longer.